U.S. US8VGCHC-XC2 8V 183Ah Deep Cycle Lead Acid Battery for Golf Carts RV. U.S. 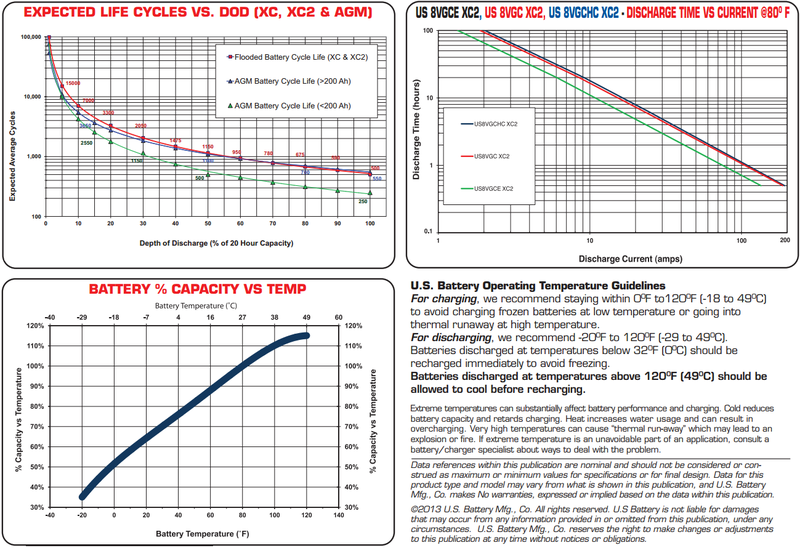 Battery's 6V Deep Cycle Flooded Lead Acid batteries are engineered and proven to provide the fastest cycle-up to full rated capacity and have the highest total energy delivered over the life of the battery. Made in America, U.S. Battery FLA batteries utilize the companys exclusive XC2 formulation and Diamond Plate Technology®, allowing them to reach peak capacity in fewer cycles, higher total energy delivery, and an extended battery life. The high charge efficiency design also meets new California Energy Commission regulations for combined charger/battery charge efficiency. And because of U.S. Batterys unique design and variety of sizes in 6, 8 and 12-volt applications, the FLA batteries offer the most compatibility with the wide range of chargers used in the field. This is why U.S. Batterys proven manufacturing processes, along with its reliable and dependable service, continues to be the most trusted world-wide brand for more than 88 years. Deep cycle batteries are constructed to maintain a continuous flow of energy. Some applications which require deep cycle batteries are golf carts, RVs, and campers, as well as appliances run by solar power. 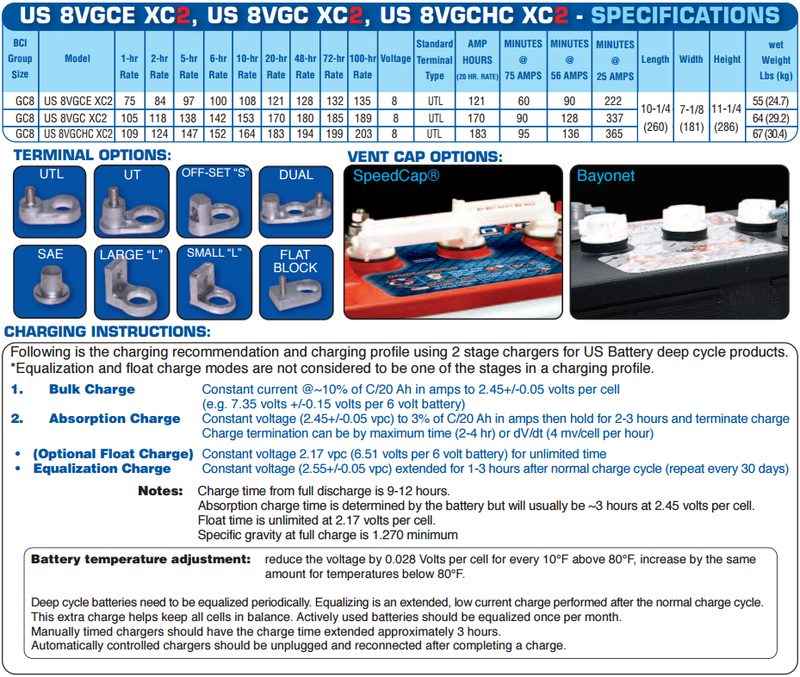 They are designed to endure the frequent, complete discharge and recharge required by these applications. They are made with thicker plates which deliver less peak current but are less susceptible to degradation caused by cycling. NOTE: We cannot ship flooded lead acid batteries via FedEx or UPS. Your order will be shipped LTL Common Carrier Truck Freight. 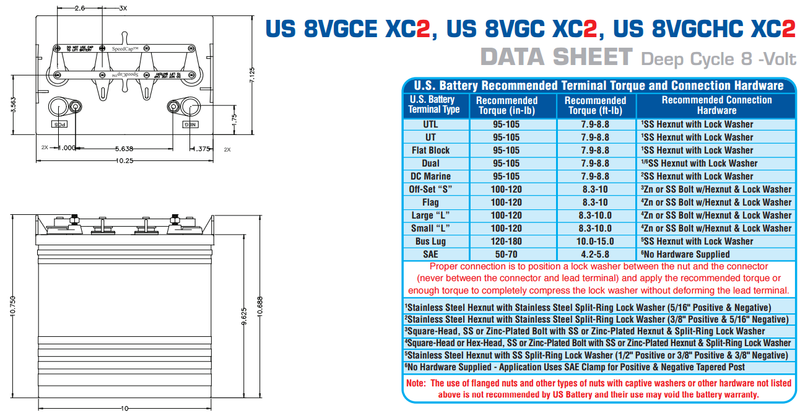 Need more US Battery US8VGCHC-XC2_2QTY? We offer great discounts on quantity orders and FREE SHIPPING offers are available. No specification or documents available currently available for US8VGCHC-XC2_2QTY. If you require a spec sheet, a msds sheet or any additional documents, please contact us and to request them. We will work to accommodate you.